Do the Anti-Tech Protests Still Matter? Outside of Google I/O yesterday morning, San Francisco's usual squad of anti-tech protesters assembled to air their usual list of grievances against the Valley giant. They may have traded their clown costumes for Star Wars outfits, but the rallying calls were all the same: no more evictions, Google's buses are hurting Muni, and the company perpetuates inequality. 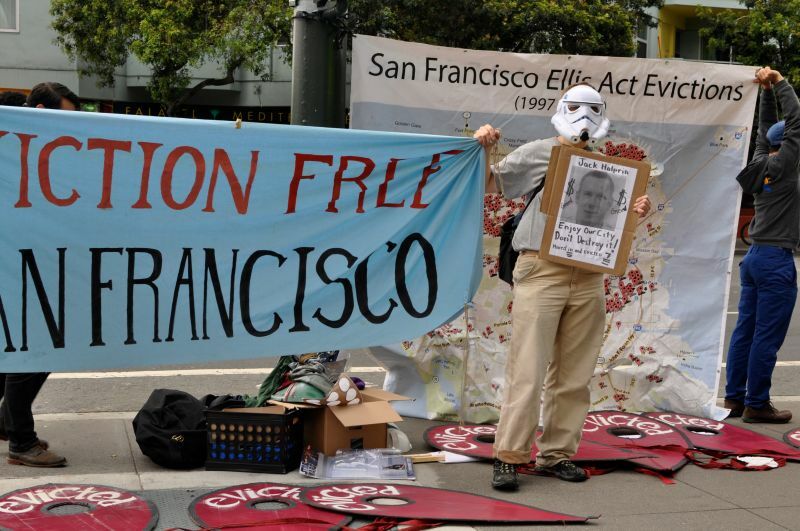 The protest, organized by a coalition that included the SEIU labor union and Eviction Free San Francisco, specifically targeted Google executive Jack Halprin and the low wages paid by Google to security guards and other contractors. 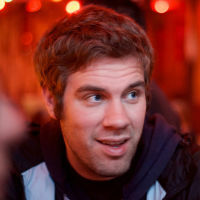 Halprin, who works as legal counsel for Google, was previously the subject of two protests in April. Demonstrators claimed he evicted seven families in the Mission District to convert a multi-unit apartment building into a single-family home. 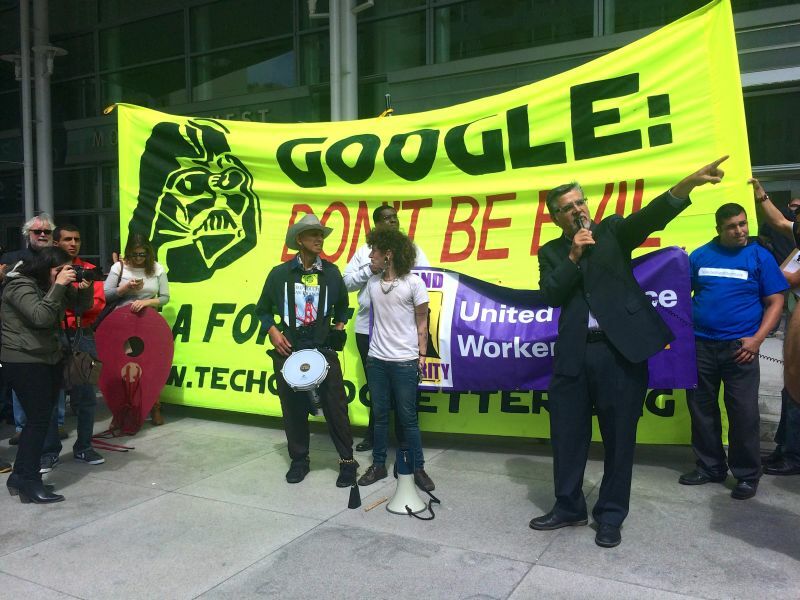 At one point during Wednesday's three-hour-long protest outside the developer conference, San Francisco Supervisor John Avalos told the 50 person crowd outside the Moscone Center that Google was "privatizing everything that's good in this world." 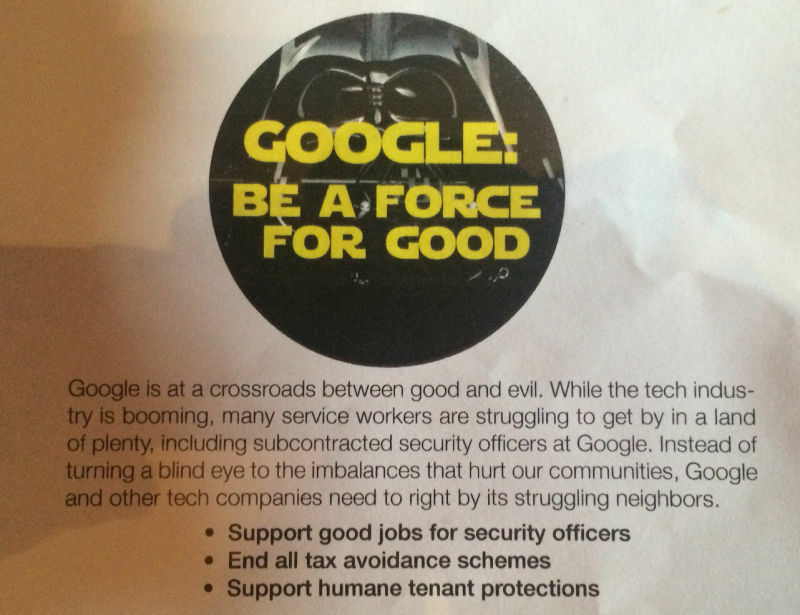 "Google has billions of dollars, and they cannot pay their janitors and security workers a living wage. It's disgusting!" Community and labor is fighting for a better world. We're fighting for a sustainable economy, for a fair economy, [for an economy] that looks into the opportunity to serve everybody—from housing to healthcare to education. We have all this wealth, but it's going back to the wealthy; it's not coming back into our neighborhoods. We cannot lose out in this defining moment in San Francisco. We have a few years left to be able to shape this city in a direction that supports working people. Maybe two, three years, and then it gets so much more challenging to shift things back. Fixing income inequality and gentrification in San Francisco sounds like its outside of Google's purview—because it is—but it comes from a place of desperation. It is clear protesters feel the lower and middle-classes are rapidly losing ground in San Francisco, and if things don't turn around soon, it will be too late. Yet the recent wave of anti-tech protests have seen quite a bit of success. Since demonstrators began targeting the Mission District last fall, they've made gentrification and displacement an everyday topic in San Francisco and forced city leaders to address the problem. The mayor has embraced raising the minimum wage to $15 a hour and an anti-speculation tax is going to the city's ballot in November. Multiple pro-tenant measures have been passed, payouts for evicted tenants have been dramatically raised, and even Republican venture capitalist Ron Conway has been pressured into supporting eviction reform. However, the movement's impact is waning. The script has stayed largely the same and turnout has hit a ceiling. The major thing holding media interest is the activists' increasing histrionics. While sympathetic politicians like Supervisor Avalos continue to push for the cause on a local level, efforts in Sacramento to curb Ellis Act evictions have hit a roadblock. Has blocking Google buses, protesting outside executive's homes, and picketing conferences outlived its utility? In an interview with Valleywag, Erin McElroy, the most visible activist with Eviction Free San Francisco, concedes their movement is struggling to gain further momentum as it is. In San Francisco, retweets have replaced chanting protesters, and politicians—no matter how tech-friendly—respond to mass anger rather than radical outrage. McElroy says keyboard slacktivism has replaced large rallies. "Not only are we up against the impact the tech boom is having on local displacement, but we're also up against an organizing culture that's become too reliant on technology." Now with street level protests experiencing low turnout and declining influence over moderate politicians, activists are looking towards new methods to score victories locally. Encouraged by repeated success at the ballot box in curbing luxury waterfront development in the city, activists are beginning to focus on direct democracy to push policy that the Mayor and his high-tech backers would ordinarily shy away form. This includes the aforementioned anti-speculation tax, which McElory says will "impose a graduated tax on speculators who flip buildings within five years of ownership." It might seem like the activists have successfully fulfilled their mission: they brought the negative effects of tech-fueled gentrification into the limelight and moved onto influencing policy. However, McElroy sees it differently. In order the keep the movement going, local activists are expanding their target, going after Silicon Valley's negative impact beyond the Bay Area, both politically and economically. As Occupy Wall Street brought wider attention to perils of Big Banks, McElroy believes a similar movement in San Francisco could do the same for Big Tech. What we're seeing here in terms of [San Francisco's] displacement crisis is related to the different ways that Google and other tech companies accumulate money nationally and internationally. Whether it's offshoring money, corporate lobbying in Washington D.C., or exploiting people, there are a lot of [issues] people are already protesting all over that amount to [tech companies] being able to pay their workers sometimes $200,000 a piece out here where income inequality is growing more rapidly than anyplace in the United States. And I think those connections need to be made and actually have the potential to help develop a broader movement. Ultimately, McElroy sees what is happening in San Francisco "as fallout" from tech's increasing adoption of typical corporate practices. She and her fellow activists are "eager" to start drawing connections between San Francisco's anti-tech protests and national opposition to surveillance, tax avoidance, and lobbying. But raising awareness only goes so far. Occupy Wall Street was incredibly successful at drawing media attention, but failed to accomplish any real change. The Bay Area's anti-tech movement will have to beyond a ten person campout at Google's Headquarters if they want to wield influence over Congress.